How the World's Leading Low-carbon Energy Company Increasingly Relies on AVEVA Technology Electricité de France (EDF) is a leading player in energy technology, whether for nuclear, hydro, wind or solar power, leading the drive towards carbon-free energy. EDF is the world's largest nuclear energy operator, running 58 plants on 19 sites in France alone. The company has ambitious plans for the future: to be the biggest electricity company in the world by 2020 with 200 GW of installed capacity. 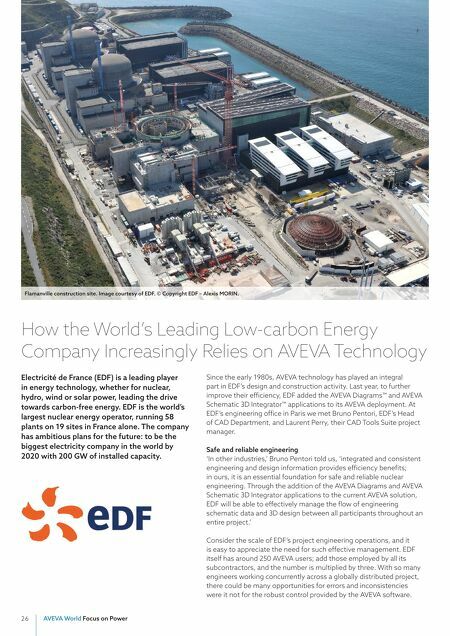 Since the early 1980s, AVEVA technology has played an integral part in EDF's design and construction activity. Last year, to further improve their efficiency, EDF added the AVEVA Diagrams™ and AVEVA Schematic 3D Integrator™ applications to its AVEVA deployment. At EDF's engineering office in Paris we met Bruno Pentori, EDF's Head of CAD Department, and Laurent Perry, their CAD Tools Suite project manager. Safe and reliable engineering 'In other industries,' Bruno Pentori told us, 'integrated and consistent engineering and design information provides efficiency benefits; in ours, it is an essential foundation for safe and reliable nuclear engineering. Through the addition of the AVEVA Diagrams and AVEVA Schematic 3D Integrator applications to the current AVEVA solution, EDF will be able to effectively manage the flow of engineering schematic data and 3D design between all participants throughout an entire project.' Consider the scale of EDF's project engineering operations, and it is easy to appreciate the need for such effective management. 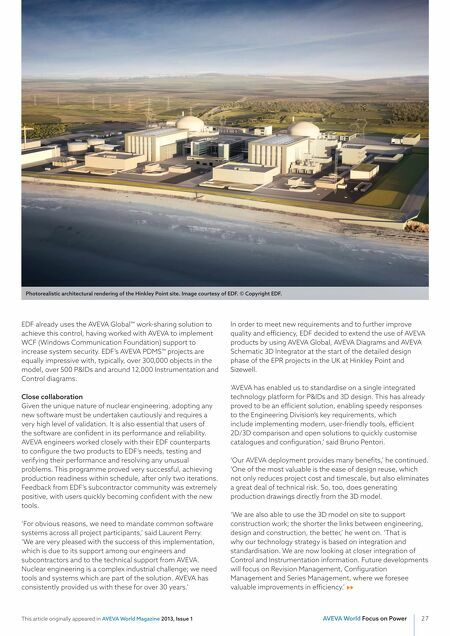 EDF itself has around 250 AVEVA users; add those employed by all its subcontractors, and the number is multiplied by three. With so many engineers working concurrently across a globally distributed project, there could be many opportunities for errors and inconsistencies were it not for the robust control provided by the AVEVA software.